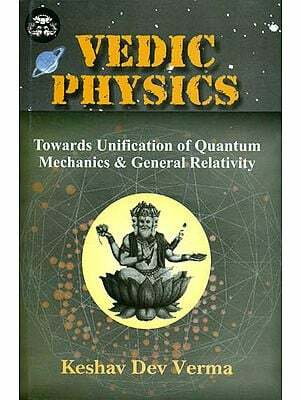 The Present book comprises the Pratyaksa Khanda (Section on perception), one of the four sections of Tattvacintamani of Gangesa Upadhyaya (1200 A.D). This Section is divided into twenty-five sub-sections, from mangalavada to sankalpakavada according to the topics discusses. Herein the author has established the standpoint of the nyaya system, after refuting the doctrines of his opponents, particularly the Buddists and the Mimamsakas of the Prabhakara school, discussing the factor involved in the process o f thinking and exposing their fallacious views. 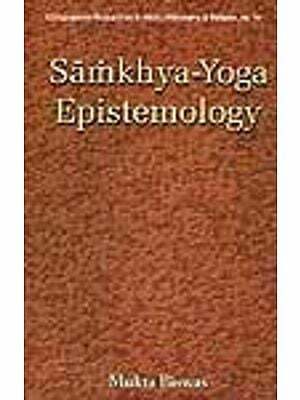 A new methodology and terminology used by the author has entered the other Sastras including grammar which become intelligible after the study of this work. The book has captured the entire intelligentsia of the traditional school of India. Besides, on Indian logic as evidenced in the writings of modern scholars like Vidyabhusana, Ingallas, potter, guha and Matilal, the present edition of Tattvacintamani comes as an indispensable work. 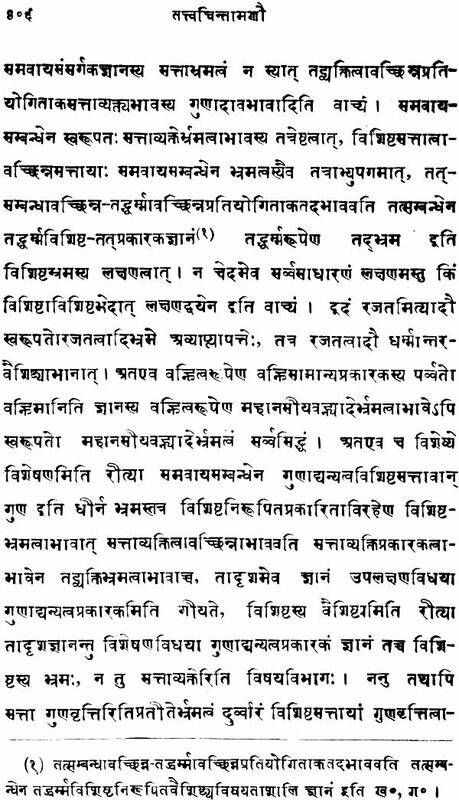 The voluminous Commentary of the Mathuranatha Tarkagisa is added to the text. 39. 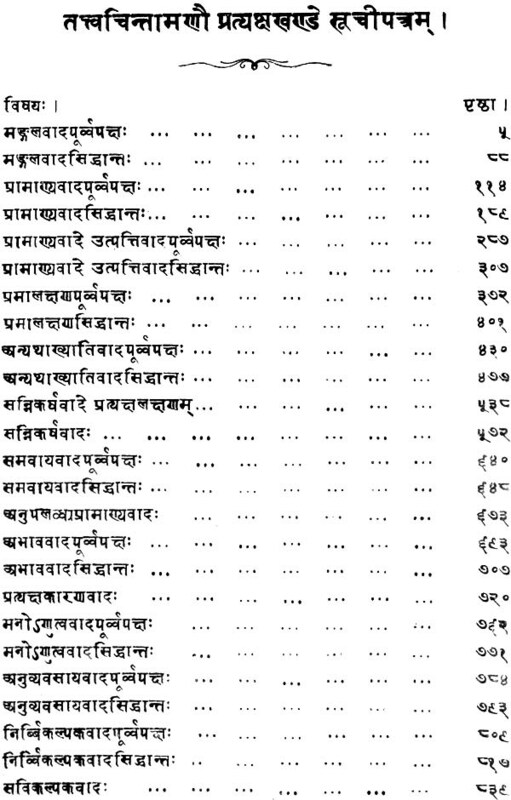 IMPORTANCE OF TATTVA-CINTAMANI The Tattva-cintamami (" a thought-jewel of truth"), otherwise known as Pramana--cintamani ("a thought-jewel of valid knowledge "), of which a short summary in English is given in the following pages, was written by a Brahmana logician of Mithila named Gangesa Upadhyaya. It introduces a new era in the development of Logic in India and is justly reckoned as the first work on the Modern School of Hindu Logic. In modern India Sanskrit scholarship is not considered of any worth unless it is accompanied by a knowledge of the 'I'attva-cintamani or at least a portion of it. The study of this work develops to an enormous extent the discursive faculty in the reader and enables him to argue with hair-splitting distinctions and subtleties. The book, since its first composition in the 12th century A.D., has been a subject of close study by the Pandits of Mithila, and about the middle of the 15th century its study was introduced into Bengal by Vasudeva Sarvabhauma, who had been educated in the academies of Mithila, Since 1503 A.D., when the university of Navadvipa was established, the Tattva-cintamani was much popularised in Bengal through the endeavours of the famous Raghunatha Siromani and others. Gradually the book was introduced into Madras, Mahabharata and Kasmira, and in a couple of centuries it became known all over India. The influence of this epoch-making book can be traced in the works on almost all the branches of Sanskrit learning that have appeared during the last five hundred years. Unfortunately no attempt has yet been made to present the contents of the work in English, Bengali, Hindi or any other modern language, perhaps on account of the bewildering abstruseness of its style and thought. 40. GANGESA-THE AUTHOR OF THE TATTVA-CINTAMANI. (1200 A.D.) The Tattva-cintamani is the immortal work of Gangesa, also called Gangesvara, surnamed Upadhyaya, who was a Maithila his uncle's house, and acquired from her, as a boon, deep erudition in the science of Logic. Gangesa mentions the name of Sivaditya Misra, the well-known author of Saptapadarthi, and makes frequent quotations from Ratna-kosa, which is a work on the Vaisesika philosophy. Nothing is definitely known about the Gauda Mimamsaka or Srikara mentioned by him. Gangesa must have flourished after 1093- 1150 A.D the period when Ananda Suri and Amaracandra Suri," whose opinions he has quoted, flourished. As he criticises the Khandana-khanda-khadya, he must have been posterior also to Sri Harsa who lived in Kanauj in the Court of King Jaya- candra in 1186 A.D. The earliest date that has been assigned to Gangesa is before the first quarter of the 13th century A.D., when his son Vardhamana Upadhyaya lived, in other words Gangesa is assigned to the last quarter of the 12th century A.D. The 'I'attva-cintamani is divided into four books dealing respectively with (1) Perception (pratyaksa), (2) Inference (anumana), (3) Comparison (upamana), and (4) Verbal testimony (sabda), which are the four means of deriving valid knowledge. The first book, whi.ch treats of perception, opens with stanzas saluting God Siva. Invocation of Blessing - Mangala-vada. Salutation is offered to Siva to invoke his blessings. The invocation is of three kinds, viz. bodily, vocal, and mental. The bodily invocation consists in saluting a deity, the vocal in reciting the eulogy of the deity, and the mental in meditating on him. "All polite people," says Gangesa. " 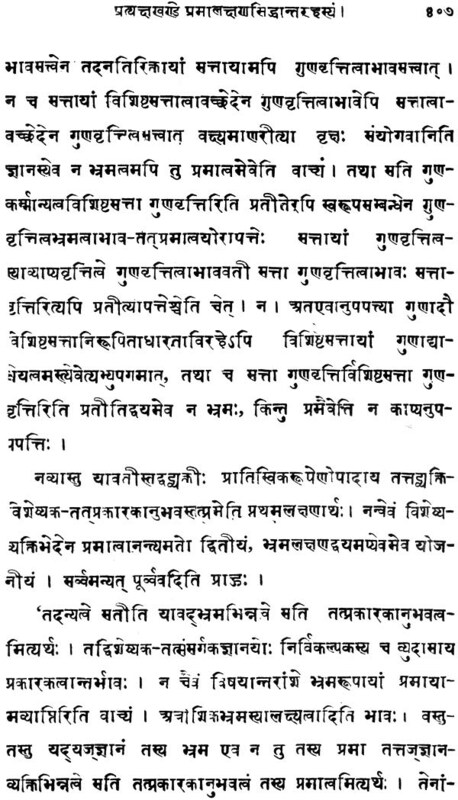 must observe the deerum of inv king blessings if they wish to bring their work to a successful completion" Though we do not find any explicit text in the Veda enjoining invocation of blessings, yet from the laudable practice of good people we can easily infer the implicit existence of such a text. It should be stated that the invocation of blessings is not the immediate cause of the completion of a work but is the means of removing obstacles which beset the work. In the case of an atheist finishing his work successfully without any invocation of blessings, we are to suppose that there were no obstacles in his way, or that he performed the invocation in his previous life. The case of a theist invoking blessings and yet failing to finish his' work, is explained on the supposition that he encountered enormous obstacles which his feeble invocation could not remove. The Kadambari, which opens with a profuse invocation of blessings, furnishes an illustration of a work remaining unfinished, owing to the excess of obstacles in its way.